NEW YORK CITY - Circa June, 2017 - People enjoy the view from the Brooklyn Heights Promenade. NEW YORK CITY - Circa June, 2015 - People enjoy the sunny weather at Bryant Park in midtown Manhattan. NEW YORK CITY - Circa June, 2015 - People enjoy a sunny day in the lawns of Central Park. NEW YORK CITY – Circa June, 2015 – An establishing shot of Washington Square Park as visitors enjoy a sunny day in Manhattan. NEW YORK CITY, Circa June, 2015 - Pedestrians with umbrellas try to avoid raindrops on the streets of New York City. 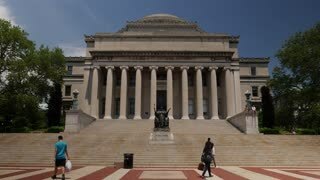 NEW YORK CITY - Circa June, 2017 - A daytime exterior of the Columbia University Visitors Center in upper Manhattan on a sunny day. 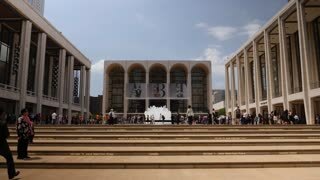 NEW YORK CITY - Circa June, 2017 - A daytime establishing shot of tourists visiting Josie Robertson Plaza at the Metropolitan Opera House. Shot at 48fps. 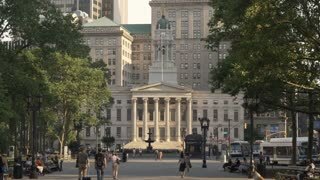 NEW YORK CITY - Circa June, 2017 - An evening establishing shot of the Brooklyn Borough Hall. 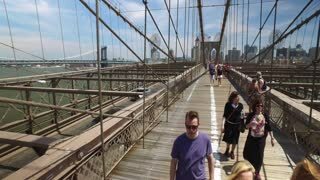 NEW YORK - Circa June, 2017 - A personal perspective walking over the Brooklyn Bridge headed to Manhattan on a sunny summer day. 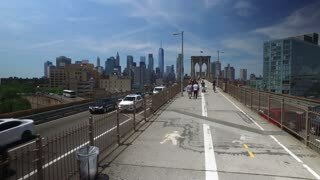 NEW YORK - Circa June, 2017 - A high reverse angle personal perspective walking over the Brooklyn Bridge headed to Manhattan on a sunny summer day.